Did you know that life is terribly unfair? It’s not fair that we let our youngest son go to camp by himself at age 11 but we made his brothers wait until they were 12. It’s not fair that one boy got more ice cream than his brothers. And it’s not fair that our entire family had to smell this Stew Meat cooking all day but couldn’t eat it until the evening came. Torture. Smelling this meat cooking all day is torture, I tell you. Honestly, it doesn’t look like much in the picture. But the flavor of this meat is incredible because of the simple seasonings you sprinkle on. 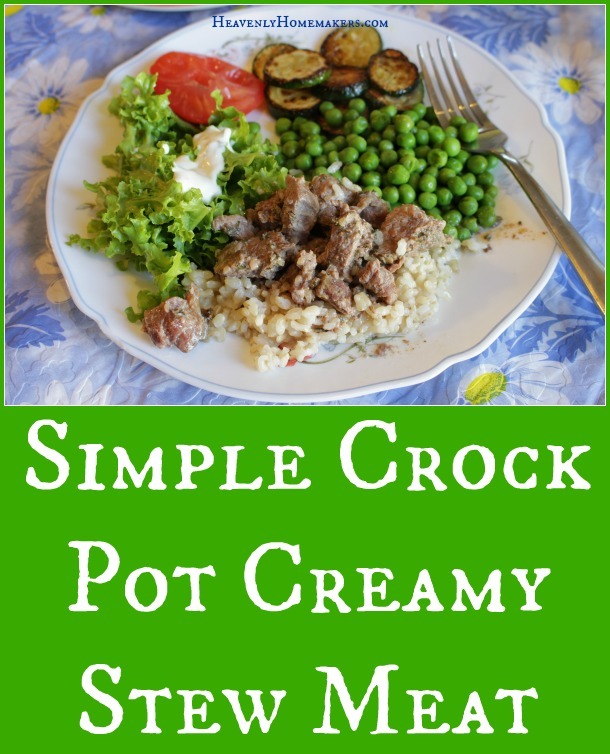 The crock pot does the work of cooking this slow and low so that the meat becomes tender and juicy. Then you add cream at the end to finish it off to perfection. Having Ranch Dressing Mix and Onion Soup Mix on hand makes putting this meal into the crock pot very quick. As you probably expected, I didn’t thaw my stew meat ahead of time. I just pulled it from the freezer and put it directly into the crock pot. Easy, easy, easy! In a crock pot, stir together stew meat, seasoning mixes, and water. Place lid on crock pot and cook on low for 6-7 hours. Add cream and heat for another 10 minutes. 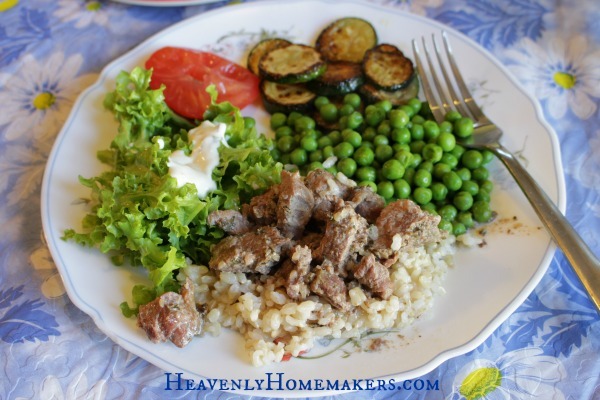 We really loved this stew meat over steamed brown rice. But it would be equally wonderful served over mashed or baked potatoes, or even whole grain pasta! Oy! The saturated fat is enough to kill the cow! I agree with your statement but for me, personally, my body does not process saturated fat efficiently despite my healthy diet, so I cannot safely consume enormous amounts of saturated fat in one meal. Love this! Our grocery store had stew meat on sale recently but I did not want to make stew- hello hot weather! I wasn’t sure what else I could do with it!